Background: An isthmocele is a diverticulum on the anterior wall of the uterine isthmus at the site of a cesarean delivery scar. We evaluated the prevalence of infertility among patients with isthmocele, the resolution of symptoms, and infertility outcomes after hysteroscopic isthmoplasty. Methods: We conducted a retrospective study of 35 consecutive patients with symptomatic isthmocele between 2010 and 2015 at Hospital Piero Palagi in Florence, Italy. Patients with symptomatic isthmocele had postmenstrual abnormal uterine bleeding, sovrapubic pain, and infertility. 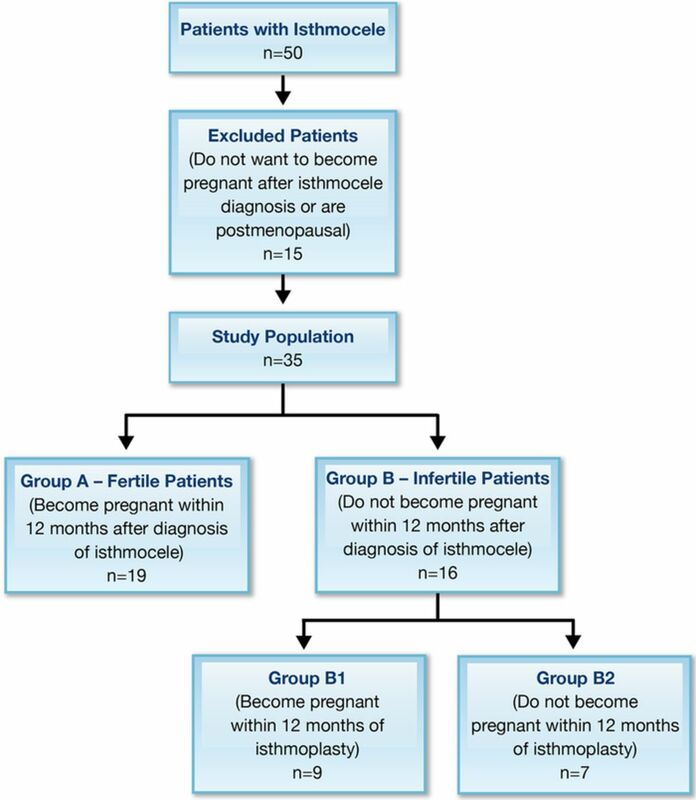 Results: The study population was divided into Group A – Fertile Patients (n=19) and Group B – Infertile Patients (n=16) according to the prevalence of infertility after the diagnosis of isthmocele. Group B was subdivided into Group B1 (became pregnant, n=9) and B2 (did not become pregnant, n=7) according to infertility resolution after isthmocele treatment. We found statistically significant differences between Groups A and B regarding the number of cesarean sections (P=0.0205), the grade of isthmocele (P=0.0421), and body mass index (P=0.0001). In the subgroup analysis, we found statistically significant differences between Groups B1 and B2 for age (P=0.0151), grade of isthmocele (P=0.0361), and cervical dilatation (P=0.0293). Conclusion: We identified a subgroup of patients at higher risk of being infertile after the diagnosis of isthmocele and a subgroup of patients who could benefit the most in terms of fertility after minimally invasive hysteroscopic surgery. The cesarean section (c-section) rate is steadily increasing all over the world1 despite the 2015 World Health Organization (WHO) statement in favor of vaginal delivery.2 WHO proposes using the Robson classification system as a global standard for assessing, monitoring, and comparing c-section rates within healthcare facilities over time and between facilities. The poor contractility of myometrium around the isthmocele caused by the presence of fibrotic tissue can produce a blood drainage deficiency with accumulation of blood during the menstrual cycle at the level of the scar and subsequent spotting,3,8 normally during the first week of the cycle. This abnormal uterine bleeding (AUB) may be accompanied by dysmenorrhea and pelvic pain attributable to the concomitant inflammation.9,10 Resectoscopic treatment of isthmocele offers the possibility of an effective, safe, and well-tolerated resolution of associated bleeding symptoms.11 Florio et al showed that resectoscopic surgery is a valid way to treat patients with symptoms of prolonged postmenstrual uterine bleeding caused by isthmocele. Data from the study indicate that resectoscopy may be the first choice because it is minimally invasive and yields good therapeutic results.12 Laparoscopic repair of isthmocele could be another option. The aim of this study was to analyze the prevalence of infertility among patients with symptomatic isthmocele who had postmenstrual AUB, sovrapubic pain, and infertility and the resolution of symptoms and infertility after hysteroscopic isthmoplasty. This retrospective study was conducted at the Hospital Piero Palagi in Florence, Italy, between 2010 and 2015 in consecutive patients with symptomatic isthmocele. The hospital is a first-level care facility located in central Italy where the authors perform approximately 1,000 one-day gynecologic minimally invasive procedures every year. The study was exempted from institutional review board approval because all the data were deidentified and collected as part of routine clinical management. Patients signed an informed consent for the surgical procedure. Patients were reevaluated 30 days after surgery with office hysteroscopy to assess the surgical correction of isthmocele and resolution of symptoms and evaluated again during their routine well-woman annual examinations. The follow-up for all patients consisted of a transvaginal ultrasound (TVU) and an interview every 6 months. Data regarding the surgical procedure and the follow-ups were obtained from patients' electronic medical records. Inclusion criteria were diagnosis of isthmocele, fertile age and willingness to become pregnant, at least one c-section, postmenstrual AUB for 2-13 days or sovrapubic pelvic pain, and no previous medically assisted attempt to conceive. Exclusion criteria were distance between the bladder and the edge of the isthmocele (measured by ultrasound) of <4 mm (as outlined by other research groups18 to reduce the risk of injury), Asherman syndrome, or presence of other female or male causes of infertility. The diagnosis of isthmocele was made through a TVU using the Voluson 730 ultrasound system (General Electric) with a 5-MHz transvaginal transducer. The examination was carried out with the patient in the lithotomy position and with an empty bladder 3-6 days after the patient's last menstrual period and was confirmed with office hysteroscopy by the same operator. The length and height of any scar defect were measured. In addition, the thickness of the myometrium adjacent to and over the defect was measured. In addition to isthmocele grade, the authors collected information about age, body mass index (BMI), isthmocele type, number of c-sections, cervical dilatation at last c-section, presented fetal part at last c-section, and surgical time of isthmoplasty. The surgical technique for the correction of isthmocele has been described in previous studies.17,18,20 Operative hysteroscopy was performed with a 9-mm resectoscope (Karl Storz SE & Co. KG) with 90° loop and 0° optic, unipolar electrical current, and sorbitol-mannitol solution as a medium of distension. A suction irrigating unit (Endomat, Karl Storz SE & Co. KG) was used to provide positive pressure (110 mmHg) and continuous outflow suction control. After positioning the bladder catheter and filling it with methylene blue, another diagnostic hysteroscopic evaluation was performed to avert the risk of injury during cervical dilatation using Hegar dilators to size 10. All procedures were performed by the same surgeon (S.C.). The surgeon resected inferior and superior edges and removed scar tissue using a resectoscope loop at the level of the lesion. Diverticulum edges were removed, creating a continuity between the wall of the diverticulum and the cervical canal. The bottom of the pouch was treated by electrocauterization with a 3-mm rollerball to try to increase the thickness of residual myometrium and to induce scar retraction of the pouch. Electrocauterization of the bottom of the niche was also performed to prevent further bleeding. The surgeon used the monopolar resectoscope loop to remove the edges of isthmocele, aiming to preserve the underlying myometrium. The surgeon proceeded cautiously, trying to create a symmetrical resection of the scar tissue, stopping the local resection when he saw the myometrial vessels coming through. He then coagulated the vessels to prevent bleeding. No complications such as excessive bleeding, uterine perforation, or hyponatremia occurred during isthmoplasty. The distribution of the continuous variables was tested with the Kolmogorov-Smirnov test, and they were all not-normally distributed. The continuous variables are indicated with means and compared with Mann-Whitney U test. Categorical data are reported as absolute values and compared with the chi-square test given the small number of samples. Statistical significance was defined as P=0.05. Statistical analyses were performed using SPSS for Windows (16.0 package, IBM). Of the initial 50 patients, 15 did not meet the inclusion criteria: 8 were excluded for not desiring another pregnancy after isthmocele diagnosis, 5 were excluded for previous medically assisted attempt to conceive, and 2 were excluded for postmenopausal age. The 35 patients who met the inclusion criteria were divided into 2 groups: Group A – Fertile Patients (n=19) are those who became pregnant within 12 months after the diagnosis of isthmocele, and Group B – Infertile Patients are those who did not become pregnant within 12 months after the diagnosis (n=16) and were, therefore, affected by infertility (Figure). Thirty-one patients had AUB, and 4 patients had sovrapubic pain as a presenting symptom. Flowchart of the study population. The mean age of the patients was 35.5 years in Group A and 36.5 years in Group B, and the mean BMI in the 2 groups was 21.8 kg/m2 and 23.2 kg/m2, respectively (Table 1). Isthmocele was identified in the superior third of the cervical canal in 24 of the 35 patients (68.6%), in the middle third in 9 (25.7%), and in the inferior third in 2 (5.7%). At TVU, 16 of 35 isthmoceles (45.7%) were grade 1, 17 (48.6%) were grade 2, and 2 (5.7%) were grade 3. All patients in Group A had had one c-section; in Group B, 12 had had one c-section and 4 had had two c-sections. Twenty-six patients had cervical dilatation at last c-section <4 cm; the other 9 had cervical dilatation ≥4 cm at their last c-section. Mean time for surgical treatment was 24 minutes (range, 15-32 minutes) in Group A and 23.5 minutes (range, 15-36 minutes) in Group B. The differences between Group A and Group B were statistically significant for the number of c-sections(P=0.0205), grade of isthmocele (P=0.0421), and BMI (P=0.0001). Isthmoplasty was successfully performed in all patients with infertility, with resolution of AUB and sovrapubic pelvic pain in 100% of cases. No complications such as Asherman syndrome, ectopic pregnancy, or vesicouterine fistula were recorded. Patients were not asked to refrain from initiation of pregnancy for a specified time. Group B – Infertile Patients was subdivided into Group B1 (became pregnant, n=9) and Group B2 (did not become pregnant, n=7) based on the fertility outcome after surgery. We found statistically significant differences between Group B1 and Group B2 for age (P=0.0151), grade of isthmocele (P=0.0361), and cervical dilatation (P=0.0293) (Table 2). No patient required a second surgical look after isthmocele correction. The median follow-up period was 44 months, with a range of 12-60 months. No patient reported any other related symptoms during the follow-up period. In 16 of 35 patients (45.7%), the isthmocele was isolated as the primary cause of infertility after excluding all the other causes of secondary infertility. In 9 of the 16 (56.3%) infertile patients, the surgical correction of isthmocele restored their fertility. In 16 of 16 patients with infertility (100%), the isthmoplasty eliminated the symptoms of AUB and pain. In 9 of 16 infertile patients, fertility was restored. Hysteroscopy is a feasible and safe treatment for restoring fertility.23,24 Gubbini et al analyzed the resolution of infertility with a similar hysteroscopic surgical treatment of isthmocele. The authors reported 100% success in all 41 patients, and yet the study has never been replicated.17 We speculate that the difference in success in restoring fertility between our study and the Gubbini et al study may be attributable to different patient selection and follow-up periods. The retrospective nature of the study is an important limitation. The limited number of patients in the infertility subgroup made a multivariate analysis impossible, and the authors did not perform a power analysis. The lack of balance between risk factors in fertile and infertile patients added to the lack of a control group of patients who did not receive treatment of isthmocele after the diagnosis of infertility and may limit the strength of the results. Another limitation is that the authors enrolled the patients using a TVU scan of diagnosis of isthmocele, whereas sonohysterography could have detected a greater proportion of patients with scar defects, thus identifying more patients for the study. In addition, the authors based inclusion in the infertility group on the time interval from the diagnosis of isthmocele. Instead, using the time interval during which the patients tried to conceive would have been more appropriate, and this definition may have affected the rate of infertility. No literature identifies the possibility of obstetric complications after treatment of an isthmocele. In addition, other studies do not recommend the timing of conception after hysteroscopy. Gubbini et al reported the first spontaneous pregnancy after 12 months. The authors consider hysteroscopy to be the best minimally invasive approach to treat this condition; all the patients had resolution of symptoms, and 56.3% of infertile patients became pregnant after the operation. The association between symptomatic isthmocele, the number of c-sections, and infertility is new, and verifying if the same association applies to the general population without isthmocele or with asymptomatic isthmocele would be interesting. Conclusions from a randomized comparative trial could reliably demonstrate both the importance of isthmocele in women's infertility and the benefits of isthmoplasty in improving patients' reproductive outcomes. We identified a subgroup of patients at higher risk of being infertile after the diagnosis of isthmocele and a subgroup of patients who could benefit the most in terms of fertility after minimally invasive hysteroscopic surgery. Studies on a large number of patients are needed to quantify the association between isthmocele and infertility. The power of hysteroscopic surgery in restoring fertility needs to be assessed with randomized controlled trials.
. Cesarean delivery: background, trends, and epidemiology. Semin Perinatol. 2006 Oct:30(5):235-241. doi: 10.1053/j.semperi.2006.07.002. WHO statement on caesarean section rates. World Health Organization. http://apps.who.int/iris/bitstream/handle/10665/161442/WHO_RHR_15.02_eng.pdf;jsessionid=9F9BC1D361C7621C8265B07B69ED11F2?sequence=1. Published 2015. Accessed December 4, 2018.
. Risk factors for development of isthmocele following cesarean section. Minerva Ginecol. 2015 Aug;67(4):301-306.
. Risk of Cesarean scar defect following single- vs double-layer uterine closure: systematic review and meta-analysis of randomized controlled trials. Ultrasound Obstet Gynecol. 2017 Nov;50(5):578-583. doi: 10.1002/uog.17401.
. Cesarean section scar as a cause of abnormal vaginal bleeding: diagnosis by sonohysterography. J Ultrasound Med. 1999 Jan;18(1):13-16; quiz 17-18. Prevalence, potential risk factors for development and symptoms related to the presence of uterine niches following Cesarean section: systematic review. Ultrasound Obstet Gynecol. 2014 Apr;43(4):372-382. doi: 10.1002/uog.13199.
. Cesarean scar defects: an underrecognized cause of abnormal uterine bleeding and other gynecologic complications. J Minim Invasive Gynecol. 2013 Sep-Oct;20(5):562-572. doi: 10.1016/j.jmig.2013.03.008. Methods for myometrium closure and other factors impacting effects on cesarean sections scars of the uterine segment detected by the ultrasonography. Acta Obstet Gynecol Scand. 2006;85(4):429-434. The cesarean delivery scar pouch: clinical implications and diagnostic correlation between transvaginal sonography and hysteroscopy. J Ultrasound Med. 2003 Jul;22(7):695-700: quiz 701-702.
. Cesarean scar defect: correlation between Cesarean section number, defect size, clinical symptoms and uterine position. Ultrasound Obstet Gynecol. 2009 Jul;34(1):85-89. doi: 10.1002/uog.6405. Clinical outcomes after resectoscopic treatment of cesarean-induced isthmocele: a prospective case-control study. Eur Rev Med Pharmacol Sci. 2017 Aug;21(15):3341-3346. A retrospective case-control study comparing hysteroscopic resection versus hormonal modulation in treating menstrual disorders due to isthmocele. Gynecol Endocrinol. 2011 Jun;27(6):434-438. doi: 10.3109/09513590.2010.495431.
. Caesarean scar pregnancy. BJOG. 2007 Mar;114(3):253-263.
. Caesarean scar pregnancy: a review of management options. Curr Opin Obstet Gynecol. 2013 Dec;25(6):456-461. doi: 10.1097/GCO.0000000000000023.
. Successful direct bipolar resection of 6th week cesarean scar pregnancy: case report and literature review. Eur J Obstet Gynecol Reprod Biol. 2014 Aug;179:229-231. doi: 10.1016/j.ejogrb.2014.03.040. Intrauterine adhesions after open myomectomy: an audit. Eur J Obstet Gynecol Reprod Biol. 2014 Aug;179:42-45. doi: 10.1016/j.ejogrb.2014.04.034. Surgical hysteroscopic treatment of cesarean-induced isthmocele in restoring fertility: prospective study. J Minim Invasive Gynecol. 2011 Mar-Apr;18(2):234-237. doi: 10.1016/j.jmig.2010.10.011.
. Hysteroscopic treatment of symptomatic cesarean-induced isthmocele: a prospective study. J Minim Invasive Gynecol. 2015 Feb;22(2):297-301. doi: 10.1016/j.jmig.2014.09.011.
. Risk factors for incomplete healing of the uterine incision after caesarean section. BJOG. 2010 Aug;117(9):1119-1126. doi: 10.1111/j.1471-0528.2010.02631.x.
. Hysteroscopic isthmoplasty: step-by-step technique. J Minim Invasive Gynecol. 2018 Feb;25(2):338-339. doi: 10.1016/j.jmig.2017.09.002.
. Physical activity and body mass index among women who have experienced infertility. Arch Med Sci. 2013 Jun 20;9(3):499-505. doi: 10.5114/aoms.2013.35342.
. Hysteroscopic treatment of the cesarean-induced isthmocele in restoring infertility. Curr Opin Obstet Gynecol. 2012 Jun;24(3):180-186. doi: 10.1097/GCO.0b013e3283521202.
. Hysteroscopic management of uterine arteriovenous malformation. JSLS. 2017 Apr-Jun;21(2). doi: 10.4293/JSLS.2016.00109.
. Uterine arteriovenous malformation: hysteroscopic identification is possible. J Minim Invasive Gynecol. 2016 Mar-Apr;23(3):293-294. doi: 10.1016/j.jmig.2015.10.007.
. Resectoscopic correction of the “isthmocele” in women with postmenstrual abnormal uterine bleeding and secondary infertility. J Minim Invasive Gynecol. 2008 Mar-Apr;15(2):172-175. doi: 10.1016/j.jmig.2007.10.004.